The men’s 1500m final is expected to be exciting and a bit unpredictable as there are three sub-4:00 milers and seven low-4:00 milers in the field and this event tends to be more tactical in recent years. Dartmouth’s Tim Gorman took the early lead of the final pack, directing the field to a 69 second first 400m. Gorman continued to lead (2:00.4 at 700m; 2:20 at 800m). Yale’s James Randon took over the lead with 500m to go with Cornell’s James Gowans on the outside shoulder while Princeton Garrett O’toole moved into third. Randon began to sprint with 200m to go but Gowans has the best response. 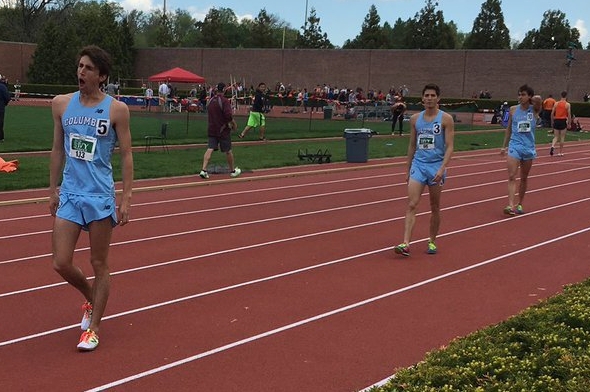 But out of nowhere Columbia’s Rob Napolitano sprints past Randon and Gowans in lane 2, Gowans ties up but Randon continues to move… it was a photo finish between Napolitano and Randon at the line… but this time, the photo is in Randon’s favor! Randon got his first Heps title by 0.02 seconds, 3:56.99 to Napolitano’s 3:57.01. Gowans was third in 3:57.23. 52.9 for the final 400m for Randon while Napolitano was 52.08 for the final 400m. 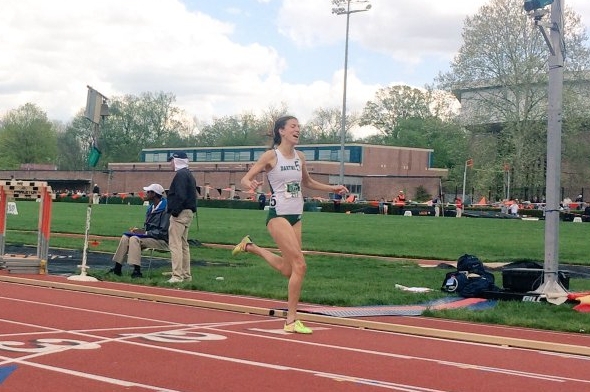 The women’s 1500m includes Dartmouth’s Dana Giordano, Yale’s Frances Schmiede, and Harvard’s Paige Kouba – who won the steeplechase 40 minutes ago. Giordano is the two-time champ in this event. Two laps in and the entire field is still together, with Giordano leading the pack while Brown’s Clare Peabody is in second place. Giordano began to pull away with two laps to go, easily getting a 15m gap on the field. At the bell, Giordano is up on 20m with Kouba moving into second place; Giordano ran a 62 second lap. Giordano was not challenged on her final lap, looking over her shoulder with 150m to go, but she had a good 40m cushion of Kouba to win. Giordano is the first ever three-time Ivy champion in this event. Schmiede outkicked Kouba in the final 50m to grab second place. Princeton got 18 much needed points in the men’s shot put as Chris Cook and Mitchel Charles threw 58-04 1/2 and 57-07 1/2, respectively. Penn’s Sam Mattis threw a new PR for third in 56-08 3/4. The sprints will be run in reverse today due to the swirling wind conditions. Everyone had a clean start in the 110m hurdles, and while Princeton’s Greg Caldwell had the lead at hurdle 3, Cornell’s Max Hairston turned on his jets and pulled away to run sub-14 seconds to claim his third 110m hurdle title in 13.90. Hairston’s time is the second fastest in meet history, behind his preliminary round time from yesterday, 13.86. Hairston becomes the fourth man in Ivy history to have won at least three titles. 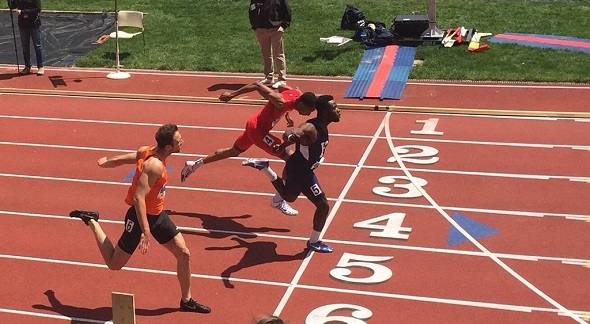 Penn’s Ben Bowers outleaned Yale’s Paedyn Gomes for second place – 14.28 for both athletes. Harvard’s Autumne Franklin was chasing history in the women’s 100m hurdle finals, looking to become the second woman to win four 100m hurdle titles and first woman to win all eight of the short hurdle titles (60m & 100m). Franklin didn’t have the fastest preliminary time yesterday – that went to her teammate Jade Miller. The field had a good start but Frankin began to pull away at the second hurdle, dominating the race in 13.44 to make history. The time is the second fastest in meet history. 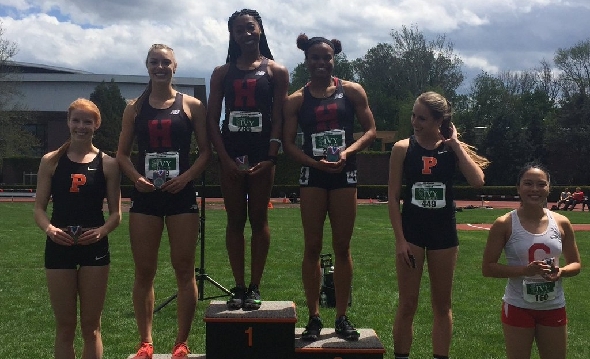 Miller finished in second in 13.89, while Harvard’s Madison Hanson – who won the heptathlon – grabbed third in 14.11, giving the Crimson 24 points. Defending runner-up, Iris Chijioke of Columbia, went down at the second hurdle but finished the race. Princeton grabbed fourth & fifth, with the Outdoor Heps pole vault champ Allison Harris finishing in fifth. Harvard has now pulled ahead in the overall team competition. It is going to be a fast 400m final with Indoor Heps champ Ray Mennin (Princeton), defending Outdoor Heps champ Marc-Andre Alexandre (Yale), and top prelim athlete Tobe Attah (Cornell) all making the final. Alexandre ate up some of the initial stagger in the first 100m but Mennin began to make his move in the second 100m as Alexandre appeared to put on some brakes (he later said it was due to the wind). Attah made up the stagger in the third 100m and was in front at the start of the final stretch, steps ahead of Mennin (who was two lanes over). Alexandre was third at the start of the final 100m but manages to edge out Attah at the line to defend his title – 47.02 to 47.08. The women’s 400m final will also feature the defending champion (Udeme Akpaete of Cornell), #1 seed (Akua Obeng-Akrofi of Columbia), and top preliminary result (Cecilia Barowski of Princeton). Akpaete made up the stagger on Barowski in the first 100m but Barowski began to make her move at the 200m mark. Barowski has a one step lead over Akpaete at the 300m mark but Barowski used her 800m strength to pull away in the final 100m to win in 52.97 – fifth fastest in meet history and third fastest in conference history. Akpaete died in the final 100m, and Dartmouth’s Jennifer Meech and Obeng-Akrofi finish ahead in second and third. Meech’s time is a new personal best and is just outside the all-time top 10. This entry was posted on Sunday, May 8th, 2016 at 12:23 pm. It is filed under Heps Champs, Spotlight. You can follow any responses to this entry through the RSS 2.0 feed.